High pressure steam cleaners reviews and recommended pressure cleaners for home and commercial use. These types of cleaners are a combination of the steam cleaner and pressure cleaner. 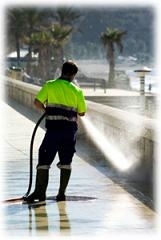 In most cases, it is a pressure cleaner that uses heated water to clean. Most of these machines are built as heavy duty cleaners and can be a bit costly. But first, what is a high pressure cleaner? It is a machine that sprays jets of highly concentrated or pressurized steam and jets of water. The water can be either hot or cold, depending on the machine. They are usually used in conjunction with detergents and other cleaning agents to clean a wide variety of surfaces which include wood, concrete, stone, metal, glass and more. The most important factor to consider when purchasing a high pressure steam cleaner is your needs. The best pressure cleaner is a highly functional one. Your first choice is whether you need a pressure washer that emits cold water or if you need a hot water/steam pressure cleaner. Cold water washers are more cost effective; however they don’t clean as well as a hot water pressure cleaner. Another factor to consider is frequency of use and time length of each use. If you need to use it regularly and for long periods of time, it is best to purchase heavy duty or even industrial strength high pressure steam cleaners. Most pressure washers are available as either gas or electric powered. Gas powered washers are meant for only outdoor use and offer great portability. Electric powered washers are meant for inside the house and need to be connected to a power outlet. They are quiet and don’t create any harmful emissions. Now that you have a better idea of your needs, we will look at some recommended pressure cleaners that emit steam or hot water. This is an industrial strength high pressure steam cleaner that is extremely powerful and is very versatile. It emits steam at temperatures up to 330º F and hot water between 180ºF-210ºF. This high pressure cleaner ejects the water at pressures up to 750 psi and you don’t have to worry about running out of water since it can connect to a hose line for continuous use. Besides spraying hot water and steam, this machine can also emit cold water which allows you to use it for a wide range of purposes. It is durable as it is made with stainless steel which is chemical and chip resistant. It weighs a hefty 200 lbs and runs on propane. This pressure washer unlike the Daimer is electric and is also more affordable at $280. As you can tell by now, hot water/steam pressure cleaners don’t come cheap and this Karcher is at the lower end of the price range. Pressures can reach up to 1850 psi and it has an induction motor which is more reliable than the universal motor. This is a great pressure washer to use around the home and it has a child safety lock so you can rest assured your kids won’t accidently hurt themselves. It comes with a Dirtblaster spray wand that increases the pressure by 50% when it is attached. • It can even draw water from standing water sources (pond, bucket etc) if a faucet is not available. This requires the water suction hose though.